At the memorial service for rapper Nipsey Hussle on April 11, 2019, at the Staples Center, those who were close to the icon paid their respect. Hussle’s girlfriend took the stage with the couple’s 2-year-old son. Also present was Cameron Carter, the son London had with Lil Wayne. Hussle’s daughter Emani Asghedom was on stage next to London. One noticeably absent person was Tanisha Asghedom, mother of Emani. It is unclear why a child London had with another man was on stage, but not Tanisha Asghedom, the mother who gave birth to his daughter. Asghedom had also said that she never broke up with the rapper, and they were still together. She also tweeted on Twitter to London telling her how the rapper still loved her. Carter told the story about a dream he had several days after Hussle died. He recounted how he was told heaven was like paradise. He also recalled how Hussle would say to him “Respect” by the window in the morning. He then led the thousands of people in the audience to recite the word. Emani was scheduled to speak next. She looked somewhat uncomfortable on stage, and emotional. Hussle’s daughter did not want to talk to the crowd, despite being prompted by London. One has to wonder if she would have felt more comfortable if her mother was there to comfort her, and if she will regret later in life not saying goodbye to her father. London instead handed the microphone to her young son Kross who babbled and cooed into the mic, to the delight of the audience. 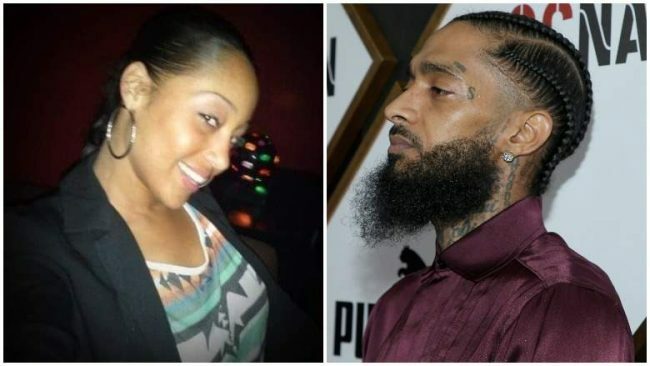 Tanisha Asghedom has not made a public statement regarding the death of Ermias Asghedom, otherwise known as Nipsey Hussle. 15 Responses to "Tanisha Asghedom Was Left Out of Nipsey Hussle’s Memorial Service [Video]"
Emani’s mom had a lot to say prior to her daughter’s father being murdered. Maybe she felt remorse and decided to let the focus stay on Nipsey Hussel. Regardless to the differences Tanisha& Lauren had the fact remains they both have children by this man who should forever be a part of one anothers life.Also every one deals with grief differently…clearly she allowed her beautiful daughter to take part in the services, maybe Nipseys family had a say we just don’t know; but before we go placing blame and making accusations lets just wait and see how everything plays out in the days, months and years that lye ahead. That’s because she is deceased as well that’s why she wasn’t there so emani lost both of her parents.